VyprVPN offers all new members a 30 day risk-free trial (money back guarantee) on any plan. All new members get thirty days to test the service. You can cancel anytime during the first 30 days to receive a refund. You can visit VyprVPN.com for more details and to sign up for the free trial. From time to time, we may offer trials of Golden Frog services for a specified period of time without requiring a payment (a “Free Trial”). We reserve the right, in our absolute discretion, to determine your eligibility for a Free Trial, and to withdraw or to modify a Free Trial at any time without prior notice and with no liability. For a Free Trial, we’ll require you to provide your payment details in order to start the Free Trial. At the end of the Free Trial, we will automatically start to charge you for the subscribed Golden Frog service on a recurring monthly or annual basis depending on your subscription type. By providing your payment details in conjunction with the Free Trial, you agree to this charge. If you decide that you do not want to become a paying user of the Golden Frog service, prior to the end of the Free Trial period you must terminate the service using our online Control Panel. In addition to the 30 day free trial, VyprVPN is currently offering our visitors a special discount. You can enjoy a full year of VyprVPN from just $3.75 a month. 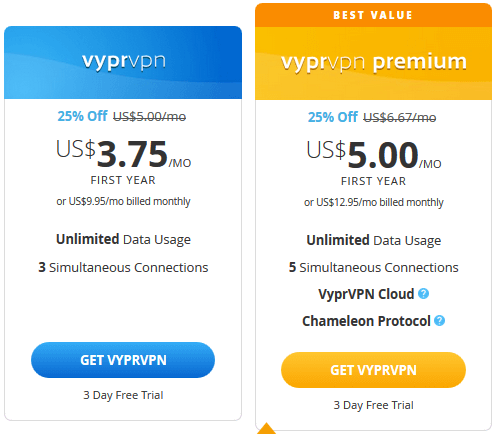 The deal includes 25% off the first billing cycle on annual sign ups in addition to the regular term savings on VyprVPN and VyprVPN Premium plans. VyprVPN is a tier-1 VPN service making this is an excellent chance to save on premium VPN access. The VyprVPN special does not require a coupon code. To take advantage of the offer visit the VyprVPN Special page. Once you’ve had a chance to review the features sign up for the desired term discount. As you can see, you can save over 60% off VyprVPN and VyprVPN Premium with their current term discounts when you sign up for a year of VPN access. Enjoy unlimited VPN access from just $3.75 a month during the current VyprVPN promotion.